Maui Sunset is the perfect vacation home. The large 112 square foot private lanai, overlooks the beautiful gardens, pool and ocean. It is perfect for watching whales play in the morning or sunsets in the evening. Located on 6.5 acres of oceanfront property makes Maui Sunset perfect for walking along the beach, relaxing by the pool, playing tennis or shuffle board with friends. A-314 was updated in the fall of 2006 and has a newly remodeled kitchen and living area. We continue to update on each visit. 2016 has added a new shower in the half bath, new window in the bedroom and blinds in the living room. We have been owners since the summer of 2002. We were looking for a place to get away from the Minnesota winters and have giant yard for our 3 kids (and typically a few more) to run and play. We found it at Maui Sunset. Our kids are grown but we all have some of our best memories at Maui Sunset. A friend of ours owned a unit at Maui Sunset. We stayed several times. We fell in love with the location, the grounds and the feeling of Maui. When the opportunity to buy a unit at Maui Sunset came up, we knew this was the place to be! The view of the ocean is breathtaking. We rarely miss an evening sitting on the beach watching the sunset. The grounds at Maui Sunset are absolutely beautiful. We have had guests tell us they had to go pull the grass to see if it was real because it is so perfect. Whale watching, kite-surfing are great ways to spend an afternoon and it is all available from the lanai or on the beach in front of you. Counter seating in the kitchen, Table and chairs in the living are and table and 4 chairs on the lanai. The condo is furnished with everything you should need for a perfect vacation. There is a concierge available at the pool to help you plan events and activities. This is our first time in Maui and we thoroughly enjoyed our stay at Maui Sunset A314. It comfortably housed our family of five. They had many useful amenities that made our stay memorable. The community at Maui Sunset was very welcoming as well. We sat at the beach every night to watch the sunset and we enjoyed the pool too. We appreciated the little Hawaiian touches throughout the suite. The hawaiian coffee mugs and plates and other hawaiian decor that made our first hawaiian experience for the kids so much fun. thank you very much. 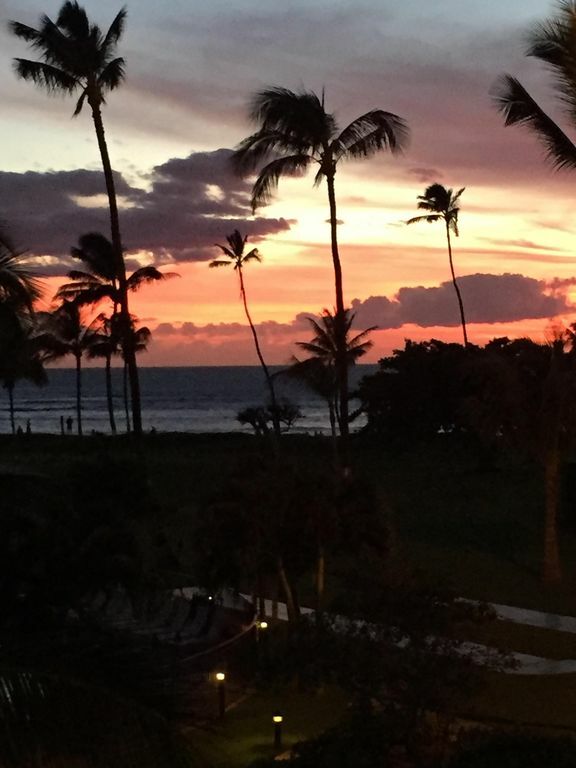 we will definitely recommend Maui Sunset to our friends and hope to go back one day! Thank you so much and we are thrilled you enjoyed your stay. Please come again! I hope you got to see the turtle on the beach. I guess we have one that has been coming in every morning to rest. It was so fun for our grandchildren the week before. Beautiful Location for 30 Days! This condo worked out perfectly for our family. From the lanai we enjoyed our morning coffee and watched the sunsets each evening. The grounds are groomed impeccably. The condo was clean and well-supplied with all that we needed. We love spending time on the Kihei/Wailea beaches-and then coming back for some pool time in the late afternoon. We definitely recommend this property to others for their upcoming vacations. The property is well maintained and the unit was clean, comfortable and well equipped. Lovely condo in a complex that is well-managed, clean, neatly manicured, with views of the ocean at all times. A quiet, family environment. We’ve returned often to this property and have always been pleased. The condo provided us with just what we were looking for for a five night stay on Maui. It is not a luxury condo, but a very nice condo with everything and more we needed for our stay. The full sized kitchen and washer and dryer are great to have. The grounds are really beautiful and the views of the ocean are picture postcard perfect. The condo is in a great location for getting around to other areas of Maui. It is conveniently located near shopping and restaurants. If I am looking for a more budget priced place to stay on Maui, I would definitely consider this condo again. Great value. Very clean. Nice view. Just north of the very busy downtown Keihi (which is nice). We will be back!! Rates do not include the 13.41% Hawaii GE/Lodging Taxes (HI Tax ID TA-077-893-2224-01 and GE-077-893-2224-01) There is a $125 cleaning fee for each stay. 2 night deposit required to hold the hold the unit.